View of Leno Levy and Shelby White court, Roman Sculpture. First Century, B.C. The classics have been fished out of the gutter at the Metropolitan Museum, or more literally, the hallway to the old restaurant. 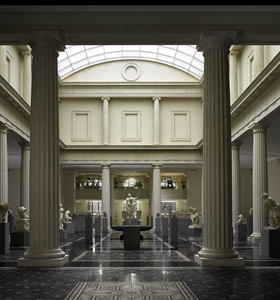 In fact, what used to be the airy café has been given over to the new Greek & Roman galleries, called the Leon Levy & Shelby White Court, stunning and ample enough to be a stand-alone museum. Familiar sculptures look fresh in a new context. Mezzanine galleries overlook the main gallery atrium as well as Central Park and house “study galleries” with cases of artifact collections by group, plus some key treasures such as the Etruscan bronze chariot. It’s a great chance to revisit old favorites given re-found dignity. Larry Keigwin is such a phenomenal performer (particularly in Mark Dendy’s “Dream Analysis”) that it didn’t seem possible that he could also be a good choreographer. But he has developed into a creator of exciting work, from visceral pure dance (“Natural Selection”) to surprisingly sophisticated group works such as “Caffeinated “– a hyperactive drill squad exercise set on a group of students, and “Bolero,” featuring a red-clad cast of nearly 50 in carefully planned, yet dizzying, pedestrian movement sequences. It is no small feat to keep such a crowd (largely untrained in dance, it would appear) orderly while moving them about the stage in patterns. Keigwin shared the program with Chris Elam/Misnomer Dance Theater, whose slow-paced mimetic dance theater proved a gruelling exercise in endurance for the audience. Nicky Paraiso and Mia Yoo have curated an unbelievably dense festival, La Mama Moves!, featuring more than 50 companies grouped under ten loose titles. I caught a night of “New Virtuosity,” which true to its name featured highly challenging, physical, complex choreography. CorbinDances led off, followed by the similarly titled Dance Theaters of Dusan Tynek, Nicholas Andre, and Ko-Ryo. (Battleworks performed on another night.) These troupes make drama not through obvious narrative, but primarily through propulsive movement, interaction, and proximity. The works were so thoroughly physical that the issue of exhaustion arose… does a move performed by the same dancer – starting fresh, and becoming increasingly depleted — change, and how? For sure, their shared sense of crazy exhaustion lends an undeniable camaraderie.